Azulejo and zellige. I know, readers! These are tough words to get your mind and mouth around. But they’re relevant terms if you’re traveling through Portugal, Spain and Morocco which is what I did last April and May. Before I share a bunch of new posts with you about this region of the world, it’s important to understand the meaning and history behind these two related words. You’re going to see azulejos mostly in my photography of Portugal, zellige mostly in my photography of Spain and Morocco, and the influence and presence of both throughout my photography of the whole region. 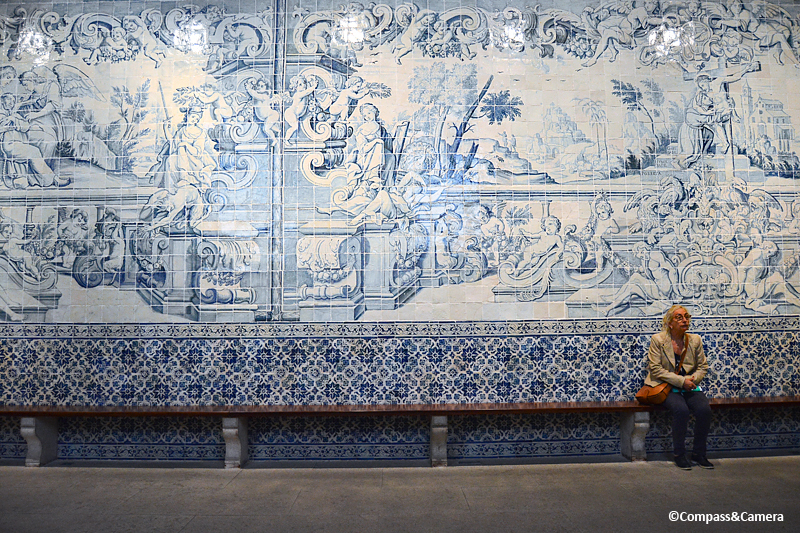 So let’s get it all started at the Museu Nacional do Azulejo (National Tile Museum) in Lisbon, Portugal. The building that is now the tile museum was originally the Convent of the Mother of God (Madre de Deus), founded in 1509 by Leonor, Queen Consort of Portugal. Through the centuries, tile was brought to the convent for decoration but little of it was applied to the interior. In the 1950s, the convent was annexed by the National Museum of Ancient Art to house its ceramic displays (along with tiles that were already stored at the convent) and eventually the annex became the National Tile Museum. 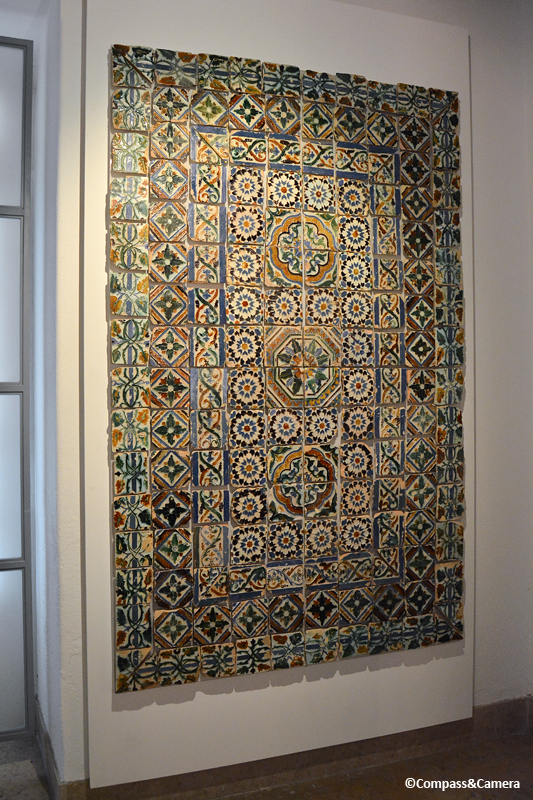 The museum tells the history of decorative tile that likely originated in North Africa in the 13th century and reached across the Gibraltar Strait into Spain and then Portugal in the 15th and 16th centuries. Initially, decorative tiles may have been a reaction against horror vacui — fear of the empty, a Greek term that has been applied to numerous styles and periods of art. 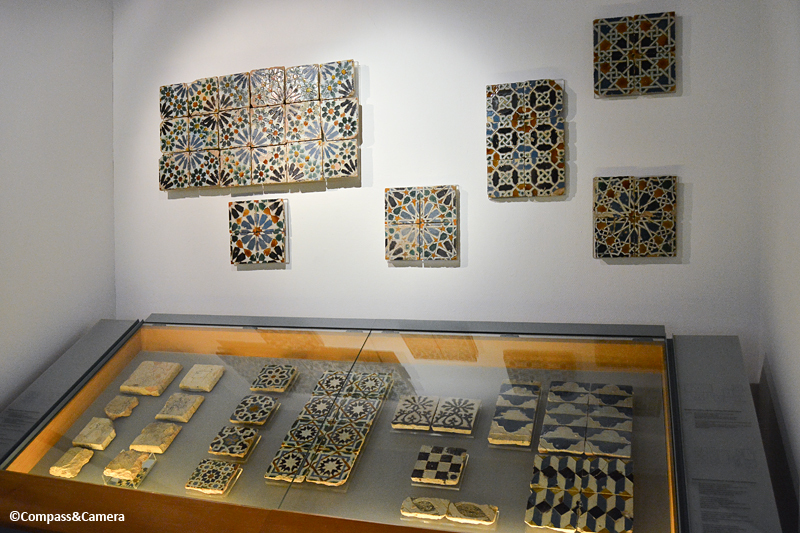 The museum offers this definition of azulejo: From the Arab word azzelij or al zuleycha, which means ‘small polished stone’, refers to a ceramic piece, usually squared, with one side glazed. Zellige is a similar Arabic word, meaning “mosaic,” particularly with geometric tiles of the style seen throughout Morocco. Because zellige is a form of Islamic art, its designs are purely geometric with no portrayal of living things. In contrast, the azulejos found throughout Portugal are painted with patterns, design motifs and scenes of life. 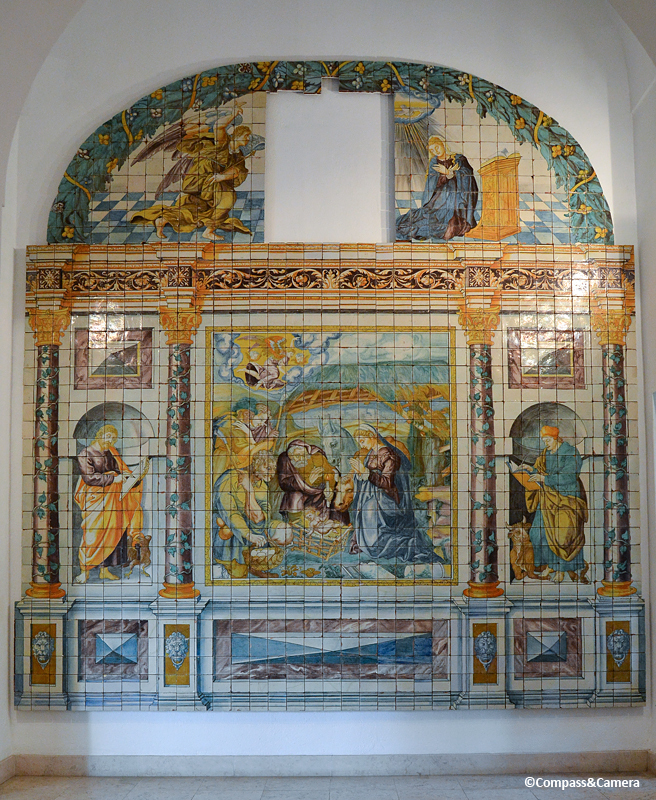 The National Tile Museum holds a historic collection of azulejos, assembled in vignettes on the walls and also applied throughout the former convent’s church, chapel and cloisters. 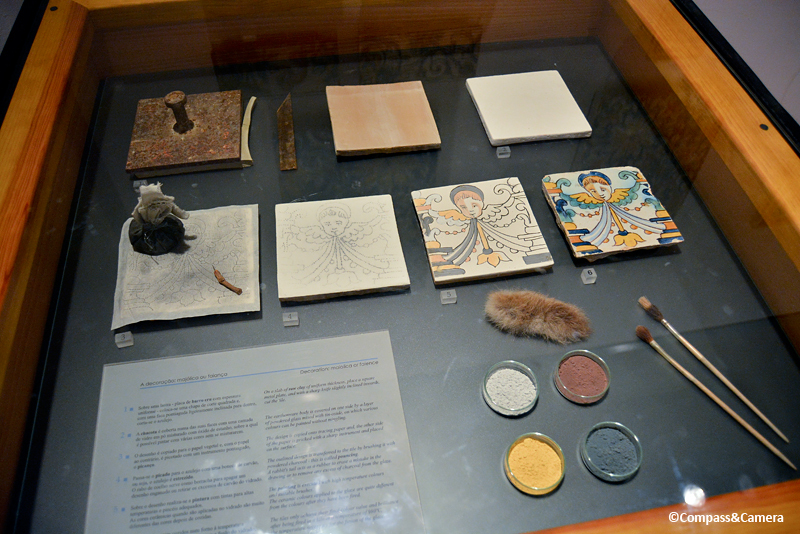 A display case at the entrance of the exhibition explains the process of making azulejo: A tile is cut from a slab of raw clay; one side is covered with a layer of powdered glass and tin-oxide; a line drawing is made on tracing paper; the paper is flipped over and pricked along the lines with a sharp instrument; the pricked tracing paper is placed over the tile and brushed with powdered charcoal to transfer the line drawing onto the tile in a process called pouncing; a rabbit’s tail erases any charcoal mistakes; the tile is painted with color and fired at a very high temperature to create the saturated, polychrome beauty of the finished piece. Azulejos were sometimes assembled together to look like tapestries, known as tapete (carpets). In the 15th and 16th centuries, the azulejo color palette was limited to blue, yellow, brown, green and white. In the 17th century, the color trend turned toward a simplified blue and white palette in the style of Chinese porcelain which was popular around the world. The museum is arranged chronologically which helps with understanding how tile design, color and illustration evolved over centuries. The AzLab, an organization of the museum, is working to identify, date and catalog the vast tile designs of homes, buildings and churches throughout the country. AzLab also has a great interactive timeline of important examples in the history of azulejos. 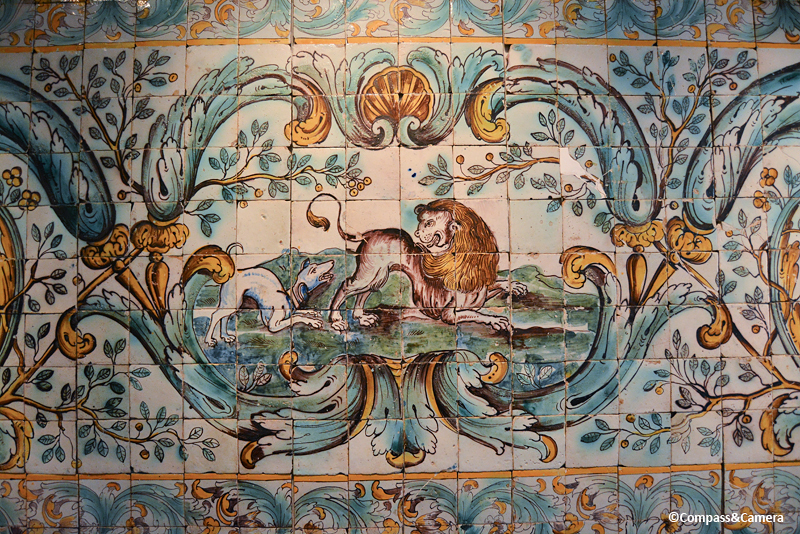 Only some of Portugal’s tiled works of art have been signed by the artists, several of whom were master oil and ceiling painters: António de Oliveira Bernardes, Manuel dos Santos and António Pereira. 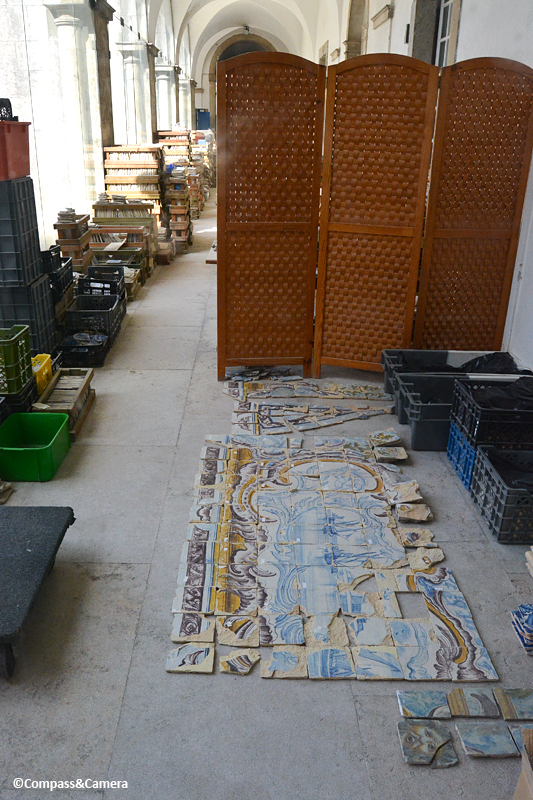 Crates of tiles are stacked along the interior hallways of the museum and restoration appears to be ongoing. What a huge job to reconstruct the tiled history of an entire nation, one small square at a time from the past 400+ years. The Manueline Cloister is beautifully decorated in 19th century tiles with a diamond pattern which complements the arched ceiling. The Church of Madre de Deus is a surprise within the tile museum, a remnant from the former days of the convent. Gilded at every glance, it’s a vibrant expression of a Baroque Portuguese interior. Upstairs the Chapel of St. Anthony is similarly covered in opulent paintings. Ending the museum tour, the Great Panorama of Lisbon wraps half of the room in a blue and white pictorial of the city before the devastating earthquake of 1755. Each tile is delicately painted with detail showing homes, ships, life along the coast and scenes from the countryside. Traveling this region that straddles the Strait of Gibraltar is like taking a visual safari through the worlds of azulejos and zellige. Colorful and intricate, one cannot walk much more than a block or an alley’s length without stopping to admire the beauty of so many tiles and mosaics, as you’ll see in my upcoming posts. If you’ve ever tiled a floor then you know the painstaking, backbreaking effort it takes to properly cut, mortar, assemble and grout a tiled surface — even with power tools, let alone manually as in past centuries. So it’s pretty easy to conclude that in the heyday of azulejos and zellige, beauty and craftsmanship must have been valued tremendously in spite of the time and pain involved in creating these works of art. No wonder the WINE of the region is so good and such an important part of Portugal’s culture! Saúde! Boy, we’ve got nothing on the ancients! I’ve always been attracted to the look of these tiles, but the history of them is every bit as engaging. I marvel all the time at the level of intricacy and and complexity (and just plain difficulty of execution, as you mention at the end) of the art, engineering, architecture, and more that existed centuries before automation, electricity, and other modern assistance. These are treasures, Kelly – thanks for sharing! Thanks, Lex! It was so fun to discover this form of art in Portugal. I could have shot a million photos! Way easier than the process of creating the art itself! 🙂 Great to hear from you. Oh this is wonderful Kelly. 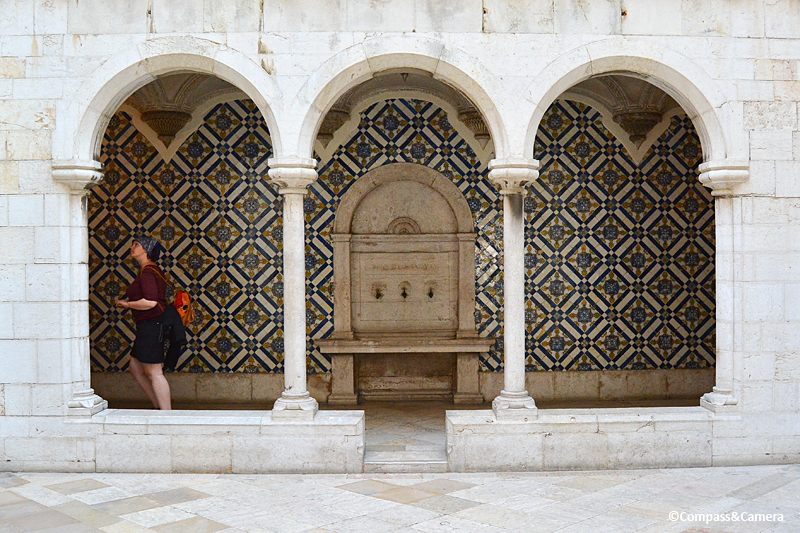 So interesting to learn a little about the tiles of Portugal. I must admit I’m not drawn to the blue and white ones so much, but I find the coloured ones exquisite. Love the cloisters, and especially the Nossa Senhora da Vida. One day we’ll get there and I’ll see for myself. Thank you! And I agree with you Alison — I like the colored tiles better than the blue and white. You and Don will love Portugal whenever you get there. We can tell you all about it when we catch up for brunch! Will reply to your email. Hope to see you soon! I absolutely adore your comment! Having renovated and tiled a house myself, I feel your pain! Mosaics are dangerous business! The money, the time, the mess, the design! SO much to think about, but so beautiful they are hard to resist. Hope you made it through the journey okay!! 🙂 Thanks for the laugh! Thank you, Jo! Happy to offer a deeper look at a really wonderful museum. Hope you get there to see it someday! If you didn’t mention about azulejo and zellige at the beginning of the post, and tapete right after the fifth photo, I would have mistaken that exquisite mosaic of floral patterns for a carpet hanging on the wall! Truly remarkable. It’s always fascinating to learn how artistic expressions evolved over generations, be it tiles, wood carvings, stone reliefs, sculptures, or paintings. Thanks for this visual treat of the museum, Kelly! Yes! The tapete! Just like a carpet, and no wonder I have such an attraction to that piece — I’m obsessed with tribal carpets. I find it so interesting that the two finished products — carpets and tapetes — have such similar looks but one is from a cool environment and one is from a warm environment. Fun to think how climate, local flora, fauna, etc. have affected the art and handicrafts of regions around the world, and the materials they’re made from. Thanks for a thought provoking comment, Bama! Fantastic post and very timely for me Kelly. We are headed there in September! Can’t wait to see these treasures in person. Thanks, Madhu! I’m so excited for you! Hope you have a lovely time! Lisbon is such a wonderful city and Portugal in general is just a very down to earth and enjoyable place. Great food, wine and people. What more does one need? I already can’t wait to go back. Great to hear from you! Yes! How can one not be affected by the beauty of them? Love it. Thanks for your comment! Beautiful photos and a lovely post! Beautiful post! 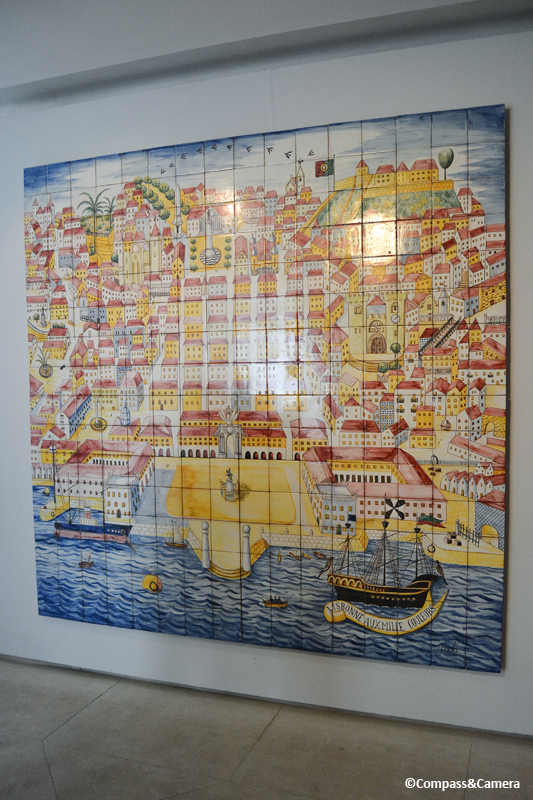 I´ve been to Portugal, to Sintra and Lisbon but not to the Museu do Azulejo. It´s a really amazing art, this post made me wish to visit this place. Thank you, Rodrigo! Great to hear you enjoyed seeing the tile museum. Hope you can visit someday!